Eating Healthy Guidelines for most means the governments guidelines that have developed over the years. But it should start with your way of thinking. The foods you like. There is no sense in eating a strawberry if they make you gag! It is important to understand why we eat. Our bodies are just like a car...for a car to run, it needs fuel. For humans, our fuel is food. We know, pretty basic stuff right. But it's important to note this as our society has turned to mindless eating or has turned into eating disorders due to some emotional issues. Look in our "Basics" section to read more about Cellular Health and Nutrition to get more information about this. Most of us have heard of the phrase. Were you able to finish it? “An apple a day keeps the doctor away!” However, in today’s world, most have changed it to “A Big Mac a day” or other unhealthy eating habit. Now an apple a day seems easy enough. It is also easy NOT to do! As you can imagine, the option you choose, along with other healthy eating habits everyday…or most days…will greatly affect your long-term health. Eating Healthy Guidelines are more than just learning to calculate grams or fat, studying labels or counting calories. Your personal philosophy, like the apple a day, is your internal guidance system used to make your choices. It is based on what is important to you...what is important to others in your life. Our approach…no food is off limits. We repeat…no food is off limits. We call it the BVM model…short for Balance, Variety and Moderation. Balance your meals with the right amount of the macronutrients carbohydrates, protein and fats. Use a Variety of ingredients and recipes to keep things changing. Moderation so you don’t have to stay away from those favorite food items (“gotta have that chocolate!”). You should always remember that restricting food in any way is always a bad thing. Healthy eating is a way of life, something that you can do to enhance your body and your lifestyle. If you’ve thought about making your life better, following eating healthy guidelines is just the place to start. You’ll make life easier for yourself, those around you, and even your family. This is another philosophy to our eating healthy guidelines. We recognize everyone is different…different tastes, different careers, different relationships, different habits and the list goes on. Each person has unique food and lifestyle needs. One person’s food is another person’s poison, and that’s why fad diets tend to fail in the long run. We support you to make positive changes that are based on your unique needs, lifestyle, preferences, and ancestral background. Finally, you didn’t get into your habits and lifestyle overnight. So we realize creating new eating and healthy cooking habits won’t change overnight either. By taking small steps…one day at a time…your chance of success will greatly increase. This applies to meal planning, grocery shopping, reading labels, calorie awareness and more. Healthy Eating – What About The Comfort Foods? Regarding the lower calorie version for example. 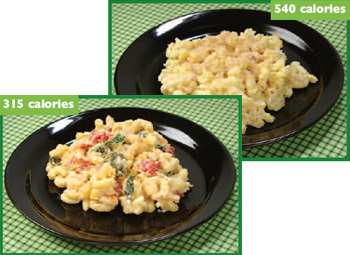 Macroni and cheese is a family favorite with recipes usually calling for whole milk, butter and full-fat cheese. Try making it with non-fat milk (even rice or almond milk), use less butter or light cream cheese. Even better are the veggies: add fresh spinach, tomatoes, peas. The key when doing this…don’t increase your portion size. By doing this, you can take the calories from 540 to 315! See what it can do? The point is figure out ways to include other foods you like in a way that will help in your eating habits. The key is ADD things you like…not take away things you “can’t” have. So are these eating healthy guidelines something you think you can follow? Whatever plan you follow, be sure to eat a variety of foods daily to receive all the essential nutrients your body needs.